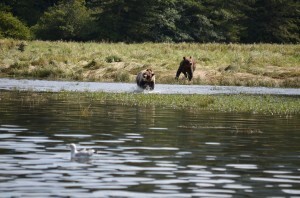 It is common to see sub-adult grizzly siblings together on the Lodge’s grizzly bear tours. 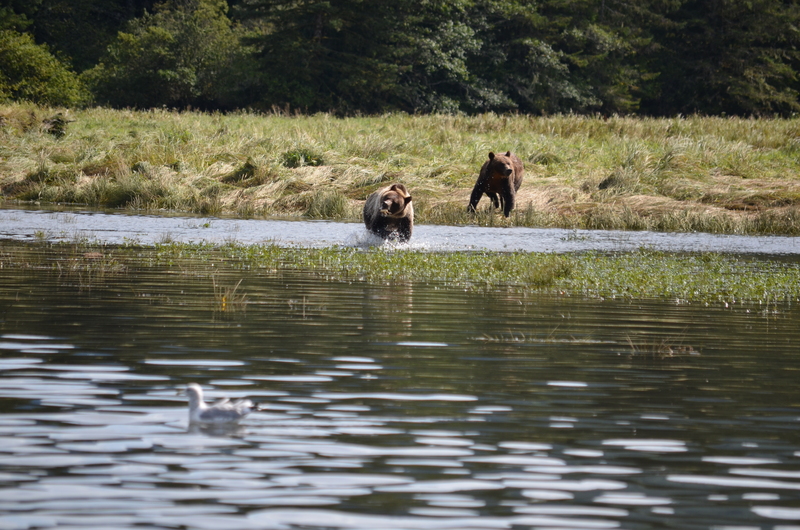 These two spent sometime in Knight Inlet’s Glendale River estuary ”playing”. Depending on food abundance, mother grizzlies may keep their yearlings a second (even a third) year, denning together again and breaking up in the third (or fourth) year. Alone and vulnerable, siblings will often stay together for some time after their mother abandons them, eating and sleeping side-by-side, and even denning together. The average breeding age for female grizzlies is 4.5 years. Males reach sexual maturity at roughly the same age as their female counterparts. Even though males are capable of breeding at three or four years of age, they rarely have the opportunity to do so because of intense competition from older, bigger males. Looking the other direction from yesterday’s post and a little earlier in the morning we have a rare sunrise. 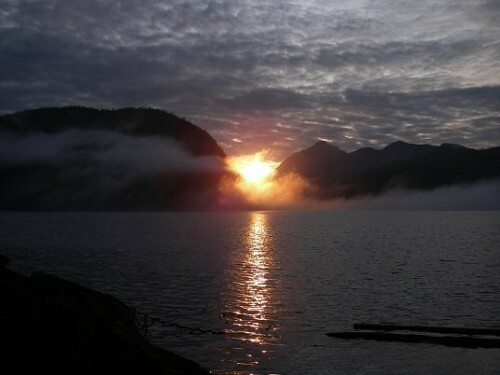 The morning cloud cover is more common than a sunny morning. By noon the overcast has normally departed for a clear day but to be honest an overcast day is much better for photos when you are on the water. A bright sun shinning down and reflecting back can make photographing challenging.